1. A Croft in the Hills by Katharine Stewart. I bought this purely because of the unbelievably twee cover which is in very good condition, despite the book having been published in 1960. 2. The Peacock Spring by Rumer Godden. I read a lot of her books way back in the year dot when I worked in libraries, I now can’t remember which ones I’ve read for sure. I looked at this one and thought I haven’t read it, or certainly have no memory of it. I wish I had kept note of all the books I had read in the past. 3. The Citadel by A.J. Cronin. I was sure that I had this book already but I haven’t been able to find it so I must have given it away. Anyway, I’m not sure if I’ve even read it before as it’s only his Hatter’s Castle which sticks in my mind from way back. If anyone wants to join me in a readalong of The Citadel – let me know. 4. 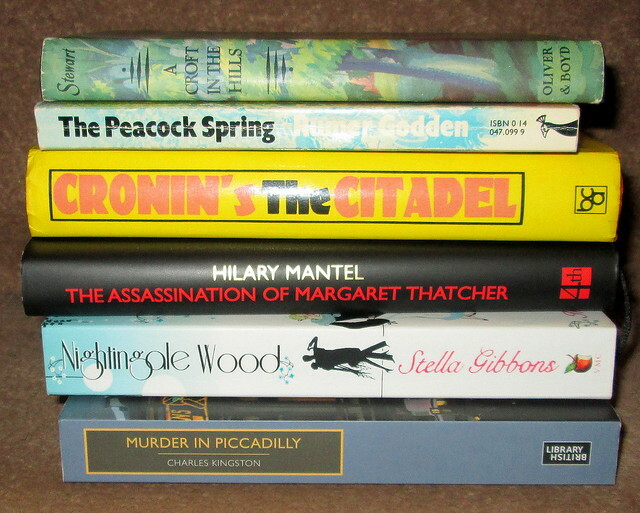 The Assassination of Margaret Thatcher by Hilary Mantel. I’ve read the title story from this collection and I’m looking forward to reading the rest in this collection of short stories. 5. Nightingale Wood by Stella Gibbons. I’ve read her Cold Comfort books and loved them. The Matchmaker was okay, this one is a Virago publication so I have high hopes of it. 6. Murder in Piccadilly by Charles Kingston (1884-1944). This is another of those British Library Crime Classics. Kingston apparently wrote twenty crime novels but he’s new to me. Have you read any of these book? If so, what did you think of them? 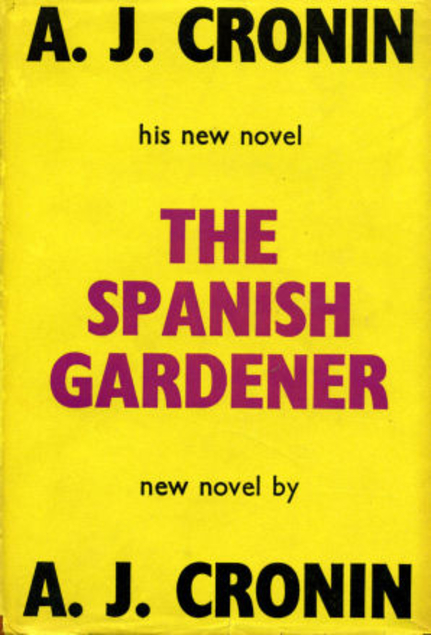 The Spanish Gardener by Scottish author A.J. Cronin was published in 1950 and was made into a film in 1957, it looks like you can see the whole of the film online, if you’re interested. It stars Dirk Bogarde, worth watching for him alone but as I recall it’s an enjoyable watch. Actually I’m not sure if enjoyable is the word, given the storyline. It’s probably more acccurate to describe it as an interesting look at a psychological type. Cronin was a doctor, a local GP in a small town (Dumbarton) in the west of Scotland and as such must have met a lot of characters in his daily life, some of whom inspired/appalled him so much that he felt the need to get their characters down on paper and write tales around them. He seemed to specialise in men who were bullying, self centred obsessives, going from the books of his which I’ve read in the past. Mr Harrington Brande is an American consul who has been sent to a small town in Spain to do his diplomatic bit, he isn’t at all happy about being given the post as he thinks that he should have been given the top job in Madrid and he feels that he has been overlooked for promotion again and again. By Brande’s estimation he is superior to almost everyone, a sure sign of people that are in fact inferior to the rest of us. His feelings of superiority and snobbery leave him open to being easily manipulated by people who know his weakness for the upper classes. Brande’s wife has left him, she was unable to stand his suffocating and controlling nature and was driven to leave him and their son Nicholas. She wasn’t allowed to have a normal relationship with her son anyway, not even having a say in what he would be named. Nicholas has been treated as an invalid all his life, so not surprisingly he is a weakling, never having been allowed to go out and do what normal boys do. He has to spend a lot of time in bed reading, no fun for a 9 year old, but the beautiful surroundings of their new home entice Nicholas to go out and walk in the garden, where he makes friends with a 19 year old gardener, Jose. Jose is supporting his whole family on the pittance that he manages to earn as the gardener, but he is also a very talented pelota player, a sort of local sporting hero. When Brande realises that Nicholas and Jose have struck up a close friendship he is consumed by jealousy, feeling that Jose is taking Nicholas away from him, so Brande sets out to punish Jose, with devastating consequences. This is the oldest building in Dumbarton, it dates back to 1623 and it is situated in the High Street next door to what used to be the good old Woolworths store, now sadly missed. Most of the time I lived in Dumbarton, Glencairn House was empty and neglected. Believe it or not it has had a bit of a facelift in recent years and at least now it is being used. It seems to be home to a credit union nowadays. The credit union is a great idea but I’m sure they could have found somewhere else for it to be housed. I wish somebody would deal with that buddleia before it does serious damage to the building. Glencairn House would be the perfect location for a tourist information centre/museum, which as far as I can see, they don’t have in Dumbarton. It has links with Robert Burns as he was made a freeman of the town in the building. Tobias Smollett and A.J. Cronin also have links with the town and Coleridge and the Wordsworths visited the town and castle too. A.J. Cronin did the research for his book Hatter’s Castle at the local library, sadly years before I was working there. Like many of his books it was made into a film in the 1950s. Considering all the history involved with having such an important landmark as the castle/rock, the links with Mary, Queen of Scots and even Merlin, the town council has done absolutely nothing to bring visitors into the town and exploit the treasure which they have on their doorstep.